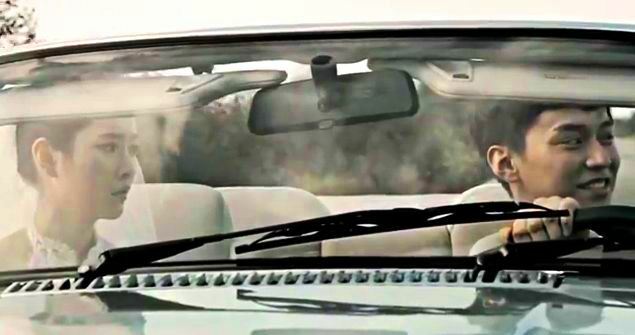 Maybee and her newlywed husband could really use a chauffeur in her new music video. It seems like there’s a 2011 trend in pop music, one I highly approve of, and that trend is the accordion. MBLAQ’s “Mona Lisa” has it, Sunny Hill’s “Midnight Circus” has it, even that ridiculously catchy Romanian song Edward Maya and Vika Jigulina’s “Stereo Love” has it. And now after three years Maybee is back, and her “Goodbye Valentine” makes great use of a lovely accordion riff. I think I must have some kind of secret accordion fetish because I enjoyed all these songs. Each part of this song has a definite arc (or phrase) where there is a clear beginning and end. The beginning of each arc brings more energy to the piece, as each new phrase is generally more interesting than the last. This lends itself to an unsettling feeling of escalating madness (which the visual elements complement nicely); because of this, when things start to go wrong in the video, I was ready for it because the music was already vaguely disquieting. Here are some examples of what I mean by arcs, if you’re still a bit confused: after the instrumental intro when Maybee starts to sing and the accordion comes in, then the next arc (my personal favorite) begins, then the next, then the chorus (which has a doubly emphasized ending), then the next arc is where things start to get weird (matching the video), etc. Something is definitely not good. There’s the odd English word and phrase, not terrible, but not pronounced particularly well (“chocolate taste,” “sweet guy,” “never and never”). My main problems are that “Valentine” is pronounced “ha-line-ta-een,” and “go away from me” should probably be more like “get away from me.” Still, nothing too major. As I attempted to describe above, the video really matches the music, and the two work in concert very well. Like Ram’s “Deceived by Love,” “Goodbye Valentine” plays with color and shadows well. Let me just begin by saying that…yeah, even though I really enjoyed the video and think it matches the song very well, I have no idea what is going on. I can only give you my interpretations or best guesses. Anyway, so we start off on a cute, romantic honeymoon, with the bride and groom driving down the highway in their convertible, but then things go wrong. Horribly wrong. The sky grows dark. The bride starts giving the groom strange looks, the camerawork starts to become more flickery and erratic, the bride pulls a gun on the groom and then herself while crying…things go downhill from there. 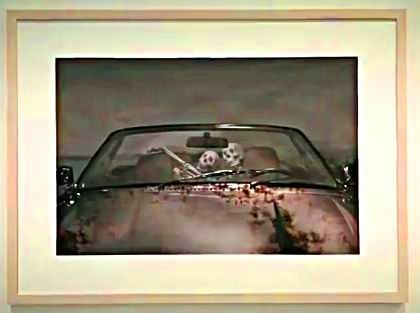 Bullets are shot, it’s unclear by whom or who gets hit, they ditch their stuffy wedding gear and start making out in the car while somehow still driving forward and simultaneously not having a wreck…then cut to a picture in an art gallery of two skeletons in a convertible hugging each other. Um. Interpretation 1: this is the straight interpretation. 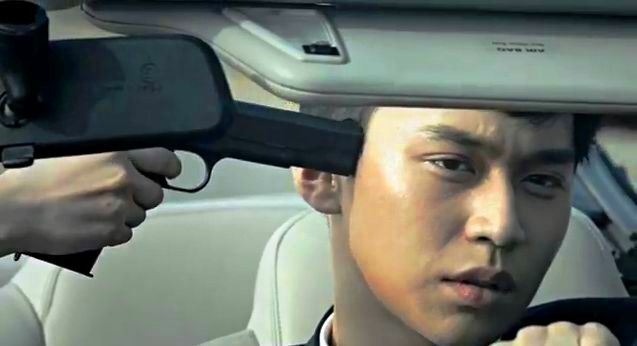 After their wedding, a husband and wife are unhappy for unknown reasons, go nuts, have one last passionate encounter, then kill each other (or the wife shoots the husband, then herself). A photographer finds them much later and takes their picture. Interpretation 2: this is the symbolic interpretation. The “driving down the road” symbolizes the journey of life. Things are all right, not perfect, in the beginning of their marriage, then the wife begins to become discontent, then feels trapped and miserable. She shares her feelings, and it becomes clear that her husband is also unhappy. They have a huge fight and consider separating, but then realize that they would be even more miserable apart. They take off some of the ties that were previously binding them (their wedding clothes—could be a commentary on strict gender roles) and manage to rekindle the passion they had lost and spend the rest of their days in each other’s arms. The lyrics somewhat support this interpretation, if any. Interpretation 3: my terrible movie script interpretation. So both the husband and wife are secret agents or spies or similar. They each suspect the other of harboring super!sekrit info and deliberately seduce each other in hopes of getting it, even though they both think something is up. So when the wife finally pulls a gun on the husband, he was kind of expecting it. But she can’t go through with it because she’s begun to actually fall in love with him, and vice versa. Meanwhile they’re also being chased by the MI5 or KGB or CIA or NIS or whomever, who want to make sure that their agents don’t go astray. So they eventually have to go on the run and shoot the people following them, or maybe the people following them catch up and punish them both by killing them. Something like that. It at least explains the scenes when they’re not in the car, which otherwise I can’t explain. 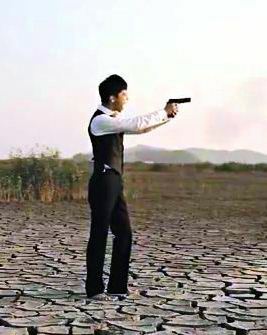 He’s shooting the evil secret agents tailing them, of course. Interpretation 4: something I just thought of. An art student sees that picture in an art gallery and wonders what kind of story could have inspired the artist to paint it. Everything is completely fictional. There’s no dance in the music video, but her comeback stage has a dance with a few cool moves (I like the “shaking him off” move on the “go away from me” part). Maybee is great at acting here and convincingly portrays the creeping disillusionment and onset of madness her character goes through. Maybee and her eyebrows of doom. I am a bit torn on this one but will probably end up buying it. I don’t love it, but it’s unusual enough and has accordion, so I will definitely want to hear it a lot more. Sunny Hill’s “Midnight Circus” really grew on me even though I didn’t initially adore it, and this song has definite similarities to that one. There are still things I don’t understand, like basically every scene that doesn’t take place in the car. Whom is the husband shooting several times in a row, if anyone? Why is he lying on the ground? Are these just symbolic representations of his feelings? I would love to hear other interpretations of this music video. Plenty of suspicious minds, but alas, no explosions. Thanks for reading! Please subscribe and leave your comments below. Also feel free to request a review. We update Monday-Friday. :) By the way, I made an album for keeping track of group members’ names as I learn them, so check it out if you want to learn with me!